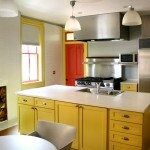 Q: I have Corian countertops throughout my house. Rather than tearing them out and using plywood and backer board as a base to install granite tile, can I leave the Corian in place and use that as the base and use mastic or thin set to fix the granite tile to the Corian? A: Keep the Corian. Forget the plywood and cement backer board. The Corian countertops will provide a good substrate for installation of granite tile. Five years ago, brother Bryan moved to a condo about a quarter mile away from Kevin in Eagle, Idaho. The condo was built in 1978. It came with the original kitchen. The cabinets were built in place, made of oak-veneered plywood stained a dark walnut. The countertops were a light shade of plastic laminate. To say the least, it was dark and dated. The first order of business was to lighten up the 1970s kitchen. Bryan spent the better part of four days priming and painting the cabinets and painting the walls and the ceiling — all bright white. Then he chose a maple floor. He decided to go with black marble tile on the countertop. So he had your question exactly. Should he leave the laminate or rip it out and replace it with new plywood and cement backer board? Because the kitchen sink was to remain the same size and in the same place, he decided to set the marble in mastic and forgo the extra work and expense of installing new substrate. Assuming the sinks will remain in the same place, we recommend you do what Bryan did and forgo demolishing the existing countertops. It will take a little preparation in the form of sanding them to provide an abraded surface to ensure good adhesion for the mastic and cutting the right-sized holes to install any sinks. Corian is manufactured with molded sinks that should be cut out to the right size for the new sinks. Corian can be cut easily with a circular saw equipped with a carbide-toothed blade. Next, sand the surface with 150-grit sandpaper. A palm sander or orbital sander is ideal for this job. The final prep step is to wipe down the surface with some lacquer thinner to remove all the oil and sanding dust, leaving a pristine surface for the mastic. Then tile away. See Bill and Kevin Burnetts feature, Patch Those Plaster Cracks.